We travel a lot. We love being on the road. We appreciate the freedom. It was always clear, that Zofia will be with us on our journey. It was also clear, that most of the places we will go to are not suitable for strollers (check out for example the streets in Trinidad, Cuba). So there is one thing, that was absolutely crucial to have: a carrier. Since her birth, Zofia has been carried by us and she loved it. 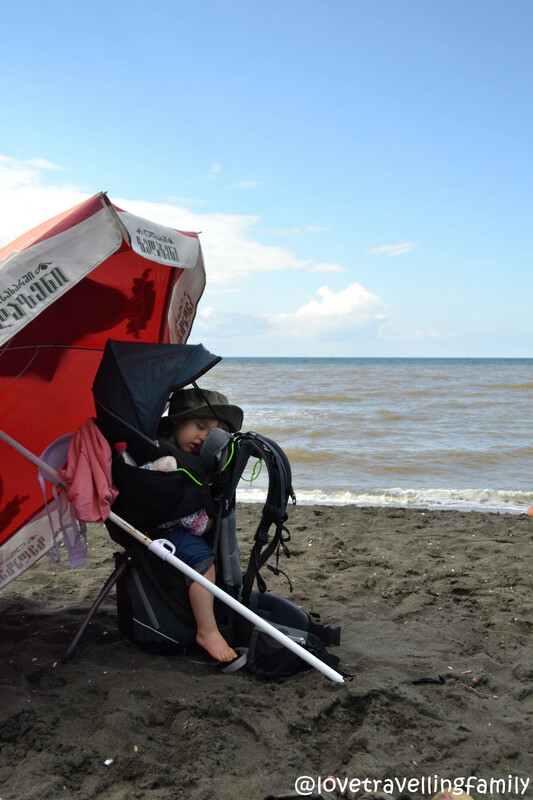 For the first time we used a carrier from Ergobaby. But after some time these kind of front carriers are not appropriate anymore. The kid wants to have more freedom and wants to see more than just the face of the person who carries (no, we never carried Zofia facing the front and also do not recommend that). In our case, this was with around 1,5 years. After this first time, the way to carry the kid is on your back in child carriers (basically a backpack made to carry kids). Here the kid sits higher, faces to the front and has more space to move. Before I even started to look for these kind of carriers, the german word „Kraxe“ produced a very old picture of carriers in my head. And thinking about using such a carrier immediately made me scared of huge back pain, discomfort for the kid and insecurity and also made me not wanting to carry anything with that. But a search in the wide web made me realize, that the todays carriers are far away from what I had in my mind. Seeing these kind of carriers made me want to go hiking immediately. But also I was quickly overwhelmed by the amount of information, innovation and variations of child carriers. To make the search for a good carrier easier I focused only on a few most famous brands: Deuter, Vaude, Osprey and Thule. Furthermore, I tried to concentrate on a small amount of (for me) most important details: Comfort for the kid, comfort for me and stowage. Luckily, this time the search for a good carrier went quite easy and quick. 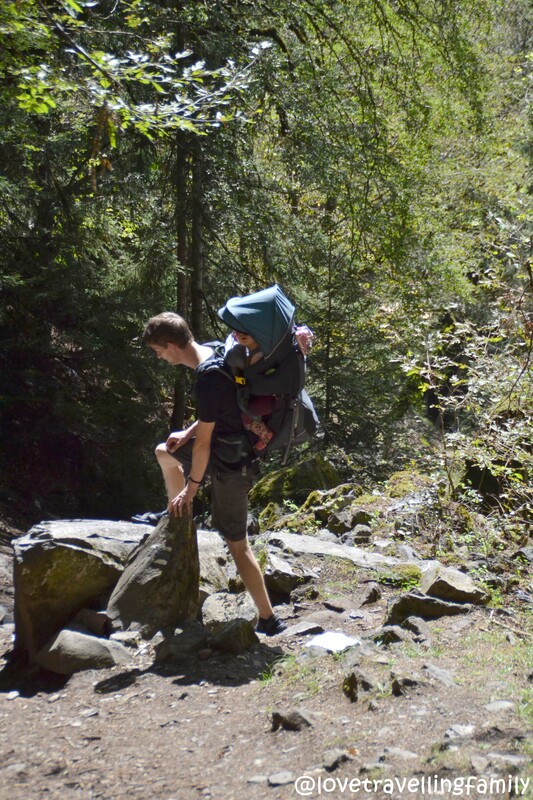 The moment I found out, that the child carriers from Deuter have the same carrying system as their regular backpacks, it was clear, that we will buy a carrier from Deuter. My big backpack is as well from Deuter and is super comfortable to carry, even if it is filled with heavy things. 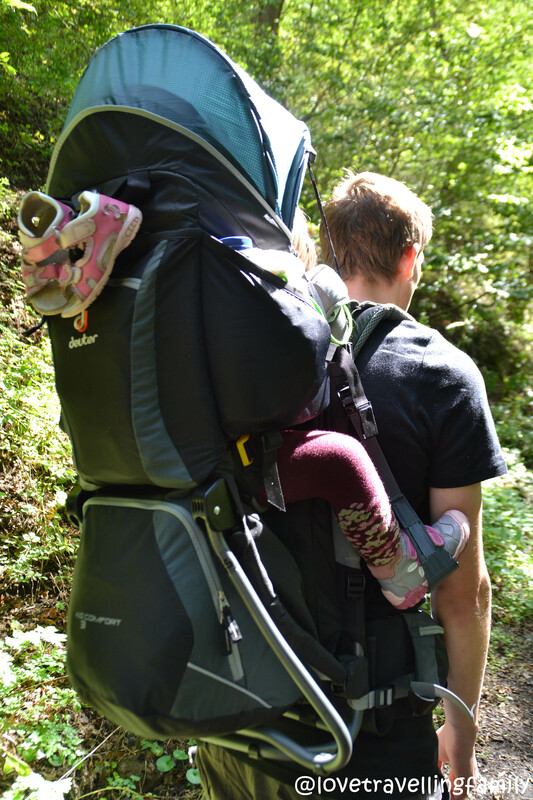 Deuter offers three different carriers: Aircontact, Kid Comfort 2 and Kid Comfort 3. While the Aircontact is made for short hikes and walks, the Kid Comfort 3 offers everything for long and challenging tours. The Kid Comfort 2 will suit the average user. Each of the models is constantly developed and often the new version improves the carrier a lot. The newest version of the Kid Comfort 3 for example comes with footrests, which is totally new on the market and very helpful. Anyway, I was still checking some reviews for different carriers, just to make sure that because of my good opinion about Deuter I am not missing something. The result of this short check: The Deuter Kid Comfort 3 is the absolute top model. It offers basically everything you can possibly wish for. One minus is the high price. But knowing that we will use our carrier intensively, I want to have the maximum of comfort and quality. At the end, we decided to buy this one. There is a huge amount of shops that sells carriers. We bought ours from the shop sport2000, since there we found the best price. Also we knew about their good service from previous orders. The process of ordering was easy and quick and the product was sent even the same day. Only one day later the carrier arrived well packed. We will use that shop in the future and can highly recommend it. When we unpacked the carrier we were once more impressed by the quality and convinced that it will do a great job. Zofia also liked it immediately as she wanted to climb it the moment we unpacked it. In the following paragraph I will give you the most important information about this carrier and at the end you will find a review based on our trip through Georgia. Due to the used Aircontact System the contact of the carrier with your back is minimized and makes your back sweat much less. The back length can be easily adjusted stepless with the Vari Fit System. With this it is possible to quickly switch with your partner to carry the child without complicated adjustments. The hip belt is extremely good and softly padded and shifts the biggest part of the weight to your hips. Furthermore it comes with the Vari Flex System, which lets you control how the load is carried. Making it more loose for light weights gives it more freedom, while making it tight in case of heavy load puts the carrier close to your hips, giving you a better control. The hip belt contains a mirror that allows you to easily check on your kid. 1) The width of the seat changes with the size of the kid. Smaller kids should sit more in the spread-squat position. Therefore, if the seat is adjusted in a high position, it is very wide. The bigger the kid is, the lower the seat will be and the more narrow it becomes, giving the kid constantly the highest comfort. 2) As written above, the Kid Comfort 3 comes with footrests. Interestingly, the advantages of footrests have not been discovered by other brands yet. But the kid sits so much better with them. It avoids the legs to fall asleep and supports the right sitting-position. Moreover, since the footrests are flexible, the kid can moves its legs much easier than if they would hang freely without any support. Btw, the presence of footrests was one of the main criteria, why we decided to buy this carrier. The carrier features an integrated sun roof, which is really big and protects even from low sun. Also it can protect from rain to a certain degree. For the best comfort for the kid, especially when it sleeps, the carrier has a thick and softly padded chin pad, on which the kid can rest comfortably. Most of other carriers have only a soft material. However, here a proper pillow is used. For washing it can be easily disassembled. For more fun for the kid the carrier has a safe side entry, with which it is able to access the carrier on its own. Even the shoulder belts for the kid are very softly padded and also easily adjustable. The stowage is with 18l quite big. There are several storage options. Under the seat there is a big zipped compartment and as well all around the seat there are many smaller options to store different things (see list below). One long compartment on the front is specially designed for hydration systems but can be also used for other things like a small rain jacket. 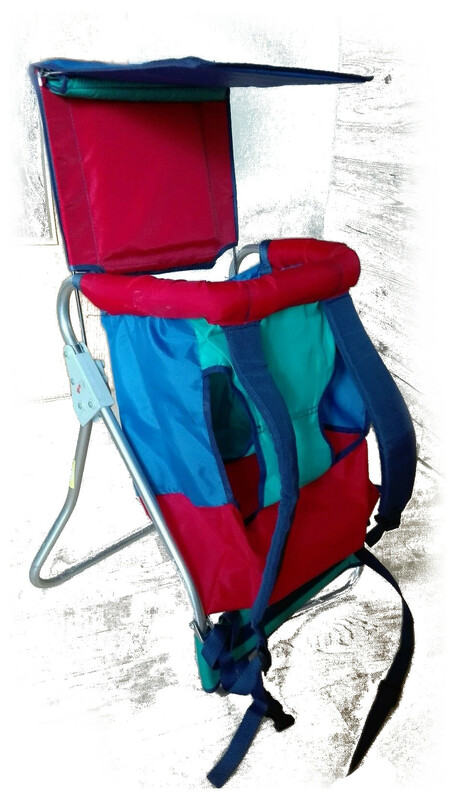 A kickstand gives the carrier a very stable stand for putting the kid in or out. The kickstand can be folded in when carrier is on your back. One of the accessory that has to be purchased separately is a rain cover that protects the whole carrier including kid from rain. The weight is with 3.5kg a bit more than the average weight for carriers. As you can read, in theory the carrier offers everything you can wish for. But how is it in reality? 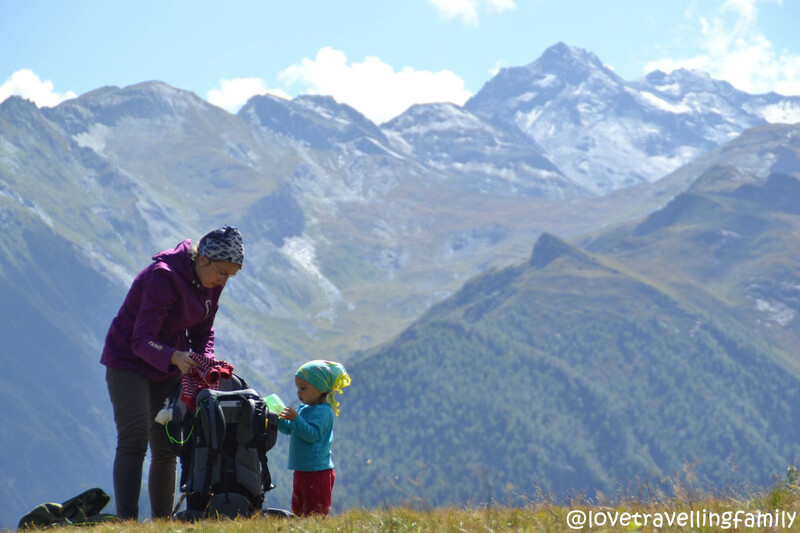 Can the kid being carried for longer distances? Is it really that comfortable? Is the seat comfortable for the kid? All of this we could find out on our last big trip. While traveling through Georgia, from the Old town in Tbilisi via the beaches of the Black See to the remotest areas of the Greater Caucasus, the carrier was used almost every day for more than two weeks. It had to prove itself on many different terrains: simple hikes along flat streets, walks through the smallest streets, climbing steep ways, long hikes through in the mountains and even discovering caves. Our result: The Deuter Kid Comfort 3 was one of the best things we bought recently, it passed all challenges with best marks. Till today Zofia likes to sit in it and also I still like to carry it. Of course there were situations when she did not want to get in, but this was exclusively because of all the thing going on around us. Why looking passively from top when you can be in the middle of everything? Before putting the kid into the seat, you should take some time and adjust the carrier properly. Only than the kid should be put into it. Here the side entry makes it really easier to either put the kid into the seat or let it climb in on its own. Once it is sitting, you should first close the breast strap and than adjust the height of the seat. The optimum height is when the kids chin is in one line with the buckle under the chin pad. A small advice: The kid sits better when you lift the tights a little bit so its bottom comes a bit to the front. This way you will get a better spread-squat position. Now the remaining belts as well as the side entry have to be closed and tightened and finally the feet put into the footrests. 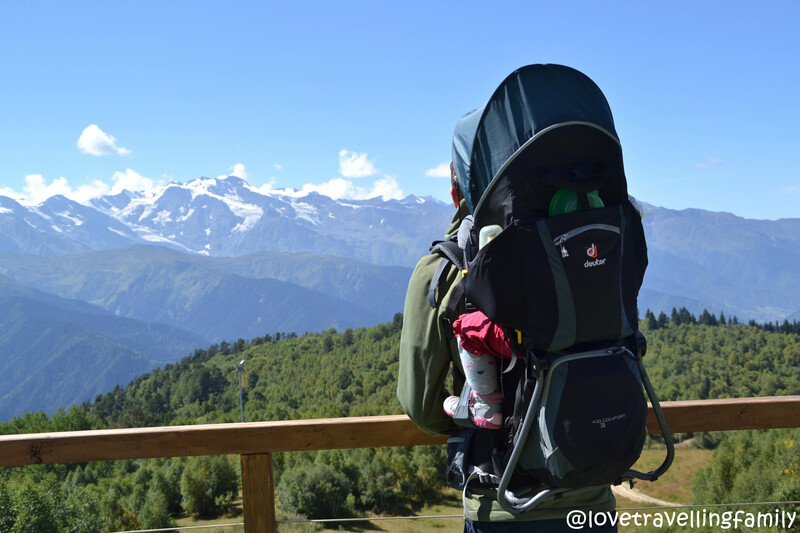 Put the carrier with kid on your back, fold in the kickstand and off you go. Hiking with this carrier is super comfortable. The main part of the weight rests on your hips as it is supposed to be. The rest is really good distributed over the rest of your body, which is important since it is quite a load that you carry. And thanks to the many adjustments that can be done, nothing moves uncontrolled but sits tightly on your body. Very nice is the space behind your back. Not once was I sweating because of the carrier! And how did Zofia like it? She loved it! The perspective, the height, the movements, the comfort, everything was perfect. And with the sun roof she was really good protected while not being affected in her panorama. Not seldom she felt asleep and thanks to the footrests as well as the thick chin pad it looked very comfortable. However, make sure to make many breaks since long sitting in these kind of systems is never good (the same applies for car seats). Articles about Georgia follow soon. If You have any questions regarding carriers of the Kid Comfort 3 in particular, please don’t hesitate to contact us. This post is also available in DE.